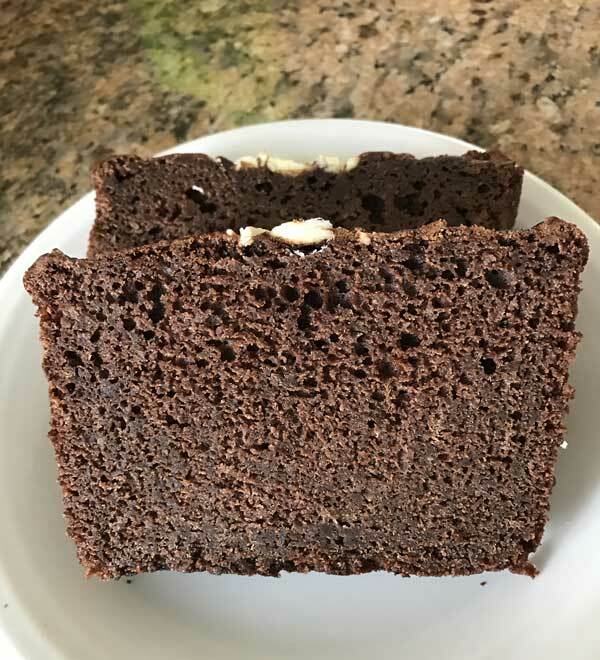 Applesauce Chocolate Syrup Cake is a rich, dense, chocolate cake made with chocolate syrup, applesauce and melted chocolate. Melted chocolate chips also work. Preheat oven to 325°F. Grease a 9x5 inch loaf pan and line with a strip of parchment. Grease again, then dust with flour. Weigh the flour, then whisk it together with the baking soda and salt. Set aside. Melt the chocolate using your favorite method. I like to melt in the microwave on high power, stirring every 30 seconds. Let cool slightly. With an electric mixer, beat the butter and sugar until creamy. Add the eggs one at a time, beating for 30 seconds after each egg is added and scraping bowl. Stir in the applesauce, chocolate syrup melted chocolate and extracts. Add the flour mixture gradually, stirring by hand or using very lowest speed of the mixer, until it is incorporated, then pour into the pan and spread evenly. Sprinkle top with nuts and chocolate chips. Bake for 1 hour or until a toothpick inserted comes out clean. Let cool for several hours, then carefully loosen and remove from pan. You can serve the cake the same day, or wrap tightly, freeze and serve on day 2. If you don't have a scale, makes sure to fluff up your flour and stir it well before measuring.